Toyota has announced the recall of certain model year 2007-2013 Toyota FJ Cruiser vehicles because the auxiliary headlights do not comply with federal safety standards. Affected by today’s recall are 11,489 model year 2007-2013 Toyota FJ Crusier SUVs manufactured between Jan. 25, 2006, and Feb. 23, 2013. The vehicles in question may be equipped with a Toyota Auxiliary Driving Lamp Kit that fails to meet federal safety standards for brightness. These lamp kits include 55-watt bulbs that, when combined with the upper beam headlights, exceed federal safety standards for maximum light output. As a result, the excessively bright lamps may temporarily blind oncoming drivers, increasing the likelihood of a crash, according to the National Highway Traffic Safety Administration. The automaker first became aware of the lighting problem last month during audit testing of Auxiliary Driving Lamps. Shortly thereafter, Toyota concluded that the defect resulted in a noncompliance, which led it to issue the recall. Toyota will begin notifying customers of the recall later this month. Authorized Toyota dealers will replace the 55 watt bulbs with 35 watt bulb, at no cost to the owner. In the meantime, owners may contact Toyota at 1-800-331-4331. Customers may also contact the National Highway Traffic Safety Administration’s Vehicle Safety Hotline at 1-888-327-4236 or go to www.safercar.gov. The NHTSA campaign number is 13V163000. Earlier this year, Toyota recalled over 310,000 model year 2007-2013 Toyota FJ Cruiser vehicles over a cracking door panel issue. According to Toyota, cracking may occur within the door panels if excessive force is used to close the door. Consequently, the seat belt retractor bracket may become fatigued and in some cases, fall off. The recall affected 209,000 FJ Cruiser vehicles in the United States; 52,000 in the Middle East; 16,000 in Canada; 13,000 in South America and Central America; 7,000 in Oceania; 5,000 in China; and 3,000 in Africa. All affected models were manufactured in Japan. 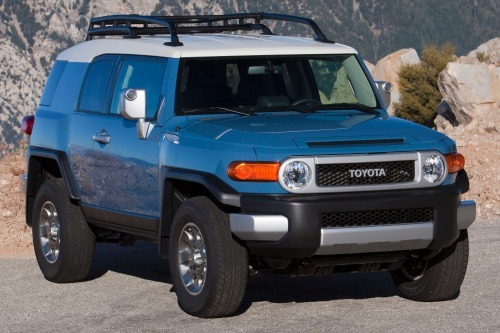 Click here to read Torque News’ coverage of Toyota’s FJ Cruiser seat belt recall. Toyota received one complaint regarding the recall, but no injuries or accident were reported. In addition to one complaint reported to Toyota, the NHTSA received six customer complaints related to the vehicle’s front seat belts. Released in 2006, the Toyota FJ Cruiser is a retro style SUV with off-road capabilities. Despite enjoying initial commercial success selling 56,000 vehicles in 2006, sales have fallen drastically in recent years. In fact, Toyota sold just 13,000 FJ Cruisers last year.